Vistalegre Rentals brings you this Casa Rio Amapas 4 surroundings with perfect views of nature and ocean are sure to make your holiday, honeymoon, business meetings and friends getaways memorable. This four bedroom Casa are the best choice for you and your loved ones. 4,500 sq. Ft of construction, fine wooden decks and green areas. This four-bedroom Casa is the perfect place to spend your holiday as a family, friend's reunion. Featuring two separate bedrooms, a spacious living room and dining room, along with the stunning scenery, it is sure to make your holiday experience memorable. The fully equipped kitchen and living area are located on the second floor, and open onto a large balcony. The living room features a large flat screen TV with Cable service. Wireless internet is available and local phone service, as well as unlimited long distance calling to the US and Canada and I-pod docking stations. There is also a laundry room with washer and dryer. 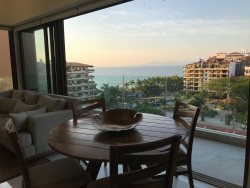 The community is set in the lush jungle just a few minutes walk to the beach and Old Town Puerto Vallarta, and the property features a common area salt water swimming pool, gym and partial views of the ocean.